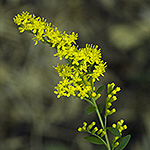 Elm-leaved Goldenrod, Solidago ulmifolia Muhl. ex Willd. Elm-leaved Goldenrod is a native erect perennial growing up to 5 feet in height with leafy stems that are mostly smooth below the floral array and sparsely hairy within the array. Leaves: The stem leaves are alternate, coarsely toothed and elliptical like an elm leaf, hence the common name. 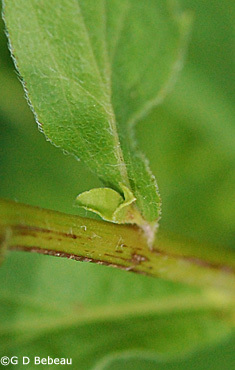 The leaf base connects directly to the stem. The upper leaves of the floral array are noticeably smaller than the lower stem leaves. The larger basal leaves may have short winged stems but are usually withered by flowering time. 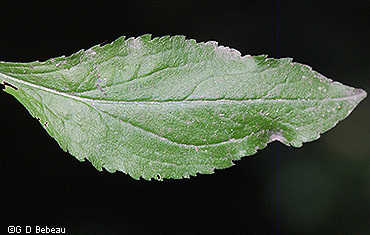 Upper leaf surfaces are dark green and can have very short stiff hair giving a rough-to-the-touch surface, the underside is much paler in color and may have some whitish hair on the main ribs. The leaves have some pronounced lateral nerves rising from the main mid-nerve. The entire floral array is a large open cluster, with branches widely spaced and the flower heads mostly are along one side of each branch of the cluster. The branches are usually backward curved and the entire cluster is usually taller than it is wide and the weight of the flower branches can cause some floppiness. Some small unstalked leaves appear within the array. The flowers of elm-leaved goldenrod are on short stalks and of two types of floret: An outer group of 3 to 6 ray florets with yellow rays. These are pistillate only and fertile. They surround 4 to 7 bisexual and fertile disc florets that have short tubular yellow corollas with 5 pointed lobes that are spreading when the floret opens. The disc floret has 5 stamens with yellow anthers - these surround and are appressed to the style and are exserted when the floret opens. Each flower head is only 1/8 inch wide and the outside of the head has 2 to 3 series of narrow green to yellow phyllaries that are smooth, without glands, unequal in size. The inner are more linear shaped and appressed to the head. The outer series are more ovate. 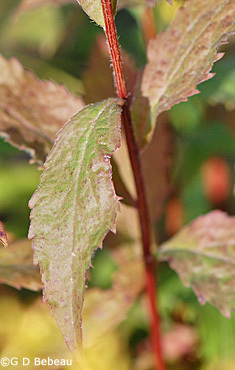 Phyllary tips are pointed and a darker green. The flower heads are on the short stalks. 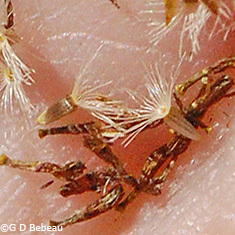 Seed: Mature flowers produce a narrowly conic dry cypsela (the seed), 1.6–2.5 mm long, light brown in color, with fine hair, 8 to 10 nerve ridges and a fluffy whitish pappus for wind dispersion. Seeds weigh about 130,000 per ounce. 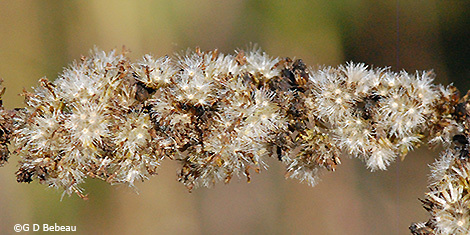 Seeds of Solidago usually require 60 days of cold stratification and light for germination. Varieties: See bottom of the page. 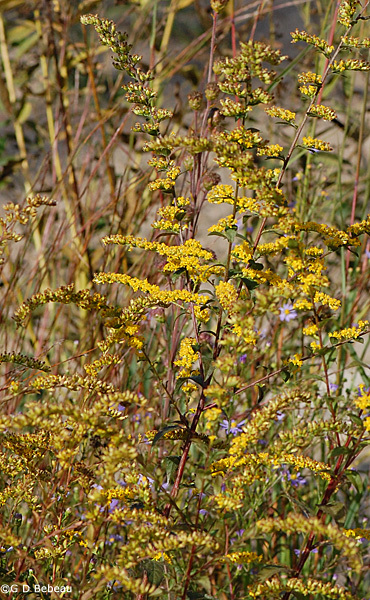 Habitat: Elm-leaved Goldenrod prefers to grow in light shade to partial sun with the soil moist to somewhat dry, but in full sun with adequate moisture they can become quite robust as one specimen in the photos below indicates, but in full sun they must have adequate moisture to prevent premature withering. It grows from rhizomatous roots with branching woody caudices. Names: The species name, ulmifolia, means 'elm-like leaves' and the genus name, Solidago, is from the Latin solidare, as the plants of this genus were known to "make whole". (see bottom of page). The author name for the plant classification is two-part: ‘Muhl’ is for for Gotthilf Heinrich Ernst Muhlenberg (1753-1815) American Botanist who produced several catalogues of plants after retiring as a Lutheran pastor. His work was revised by the other author ‘Willd.’ - Carl Ludwig Willdenow (1765-1812), German botanist, a founder of the study of the geographic distribution of plants. He was director and curator of the Botanic Garden of Berlin. Comparisons: The elm-like leaf structure is a key identifying character. 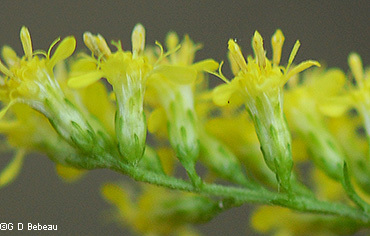 The flower area may look similar to some arrays of Gray Goldenrod or Late Goldenrod. Above: The floral array is very open with with widely spaced branches. Drawing from Britton, N.L., and A. Brown. 1913. An illustrated flora of the northern United States, Canada and the British Possessions. 3 vols. Charles Scribner's Sons, New York. Below: Flowers are dense on the branches of the array. Each flower is very small with only a few ray florets and 4 to 7 disc florets. Below: 1st photo - The flower head has 2 to 3 series of narrow, green to yellow, smooth phyllaries, without glands, unequal in size. Tips are pointed and a darker green. 2nd photo - The elm-like stem leaf has pronounced lateral nerves rising from the main mid-nerve. Lower leaves taper to a short winged stalk. Upper side is dark green and usually rough, like an elm leaf, lower much lighter with sparse hair on the ribs. Below: 1st photo - Early growth of the floral array. 2nd photo - The leaf directly attaches to the stem. 3rd photo - At maturity the stem turns red and the lower leaves fall away. Below: Mature seed heads and several of the conic ribbed seeds (cypselae). 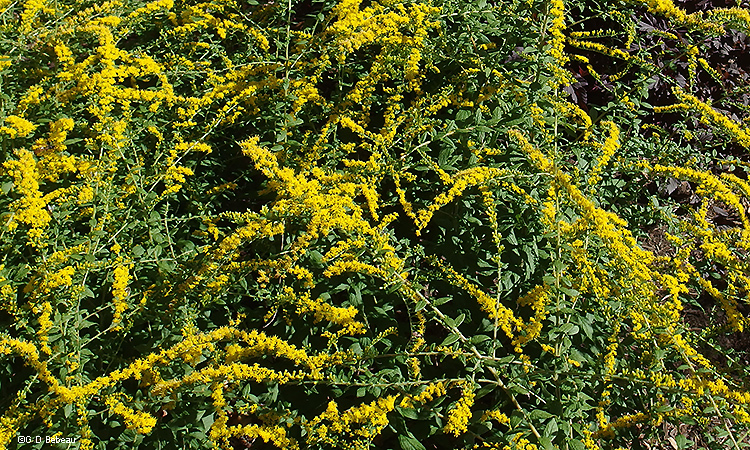 Notes: Elm-leaved Goldenrod is indigenous to the Garden area. Eloise Butler first discovered this plant growing in the Garden on Sept. 20, 1914. She added plants in 1924. 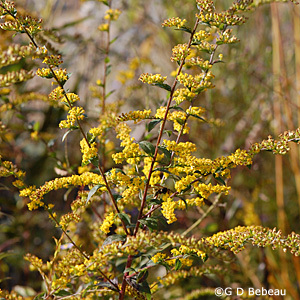 Elm-leaved Goldenrod is native to the eastern half of the U.S., from the central plains eastward, and a few of the lower eastern Canadian Provinces. Minnesota is at the northward end of the distribution range and it has been found in the wild in only 10 counties of the SE Section of the state. Contrary to Miss Butlers discovery, the DNR does not consider it native to Hennepin County but perhaps it was in her day but is no more. Varieties: There are 18 species of Solidago known in the wild in Minnesota. 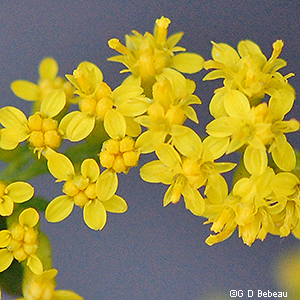 There are two recognized varieties of Elm-leaved Goldenrod, only one of which grows in Minnesota - S. ulmifolia Muhl. ex Willd. var. ulmifolia. The most recent addition to the Garden was by Garden Curator Susan Wilkins in 2009 and 2011 when they were planted along Violet Way. The other variety, var. palmeri, has distinctly hairy stems and grows in more southern areas. 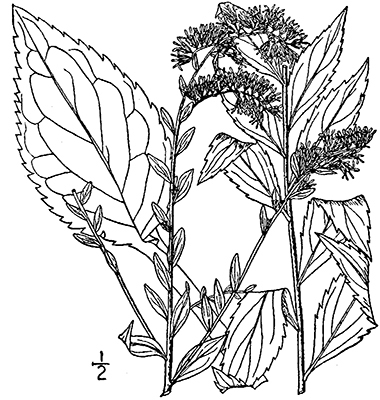 Medicinal Lore: The genus Solidago has several species whose leaves and tops and roots were used by natives for various disorders. 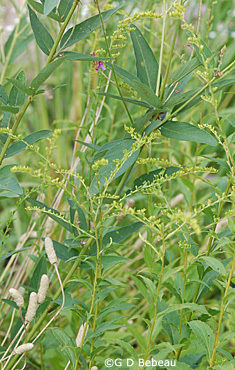 Here in Minnesota, Frances Densmore (Ref.#5) reported that the Chippewa used various species of Goldenrod for treating fevers, colds, ulcers and boils - - usually a teaspoon of leaves to a cupful of boiling water for drinkable solutions and a moistened pulverized root was applied as a poultice for boils.